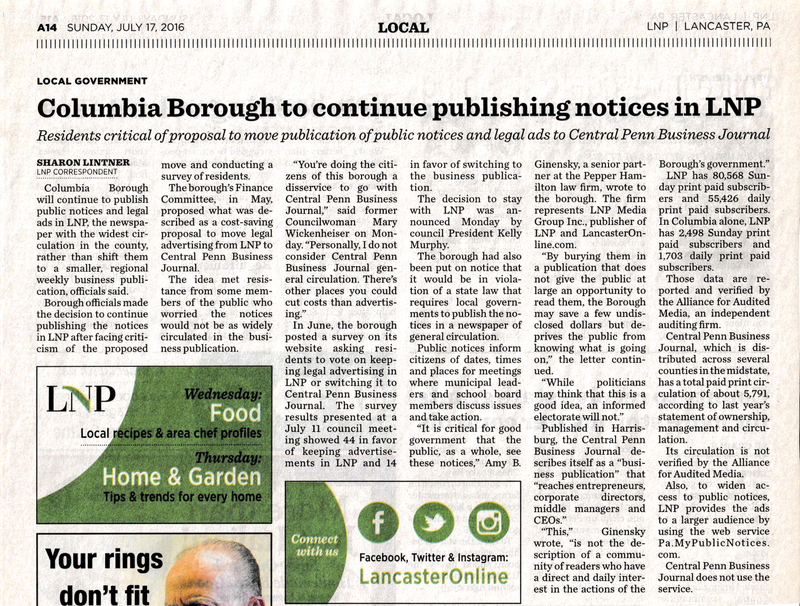 A previously settled issue was raised again at the borough's November Finance Committee meeting: whether or not the borough is required to publish advertisements and notices in Lancaster Newspapers (LNP) as opposed to other cheaper publications, such as the Central Penn Business Journal (CPBJ) or the Merchandiser. The issue had been decided and closed in 2016 after a borough survey showed residents overwhelming preferred LNP, and LNP's legal representative sent a letter to council explaining that a state law requires local governments to publish notices in a newspaper of general circulation. At the July 2016 borough council meeting, President Kelly Murphy announced the borough's decision to stay with LNP, according to an article (shown above) by LNP correspondent Sharon Lintner. However, the issue surfaced again at Monday's meeting, when committee member John Novak questioned an $800 charge for the publication of a borough bid notice. "I'm continually in awe at the cost of advertising in LNP," Novak said. His comment set off a discussion among committee members and other officials present. Finance Manager Georgianna Schreck said that some other municipalities publish their advertisements only on their websites. Committee member Cleon Berntheizel requested more information about which municipalities and any consequences they may have experienced. Berntheizel also asked if the notices could be placed in publications in another county, prompting a response from Borough Manager Rebecca Denlinger. "You advertise to give your residents notice, so it has to be a publication that your residents typically have access to," she said. Berntheizel then claimed that more residents see the Merchandiser than LNP because it's free and is delivered to every household. According to state law, however, a newspaper of general circulation must be sold at fixed prices per copy per week, per month or per year, to subscribers and readers without regard to business, trade, profession or class. Also, free newspapers are not considered "newspapers of general circulation"; therefore, legal advertising cannot be done in free newspapers, as stated below. In addition, LNP's circulation numbers far outweigh those of CPBJ, as stated in Lintner's article. 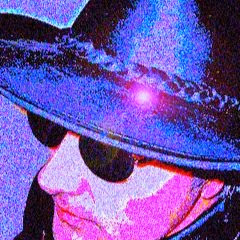 sold at fixed prices per copy per week, per month or per year, to subscribers and readers without regard to business, trade, profession or class. Basically, any daily or weekly newspaper that is sold to the public in general is a "newspaper of general circulation." subscribed for by readers at a fixed price for each copy, or at a price fixed per year. Free Newspapers: Free newspapers are not considered "newspapers of general circulation." Legal advertising cannot be done in free newspapers even if they meet all of the above requirements. Internet Publishing: The law does not specifically address including legal advertisements on internet versions of a newspaper. It is the position of the Pennsylvania Newspaper Association that "printed" legal advertisements can remain in an on-line reproduction of a newspaper, but such an advertisement cannot be considered a paid legal advertisement. The actual legal advertisement itself must be in a printed newspaper of general circulation and the advertising fee must reflect the publication in this newspaper only. Unauthorized Advertisements: Only government advertisements authorized by law may be published. In addition, advertisements may not be published in more newspapers than the law authorizes (45 Pa. C.S.A. § 310). I REPEAT HOW CAN A COUNCIL MEMBER SIT ON A BOARD THAT OWES BACK TAXES??? Laughing stock yes maybe news center 8 can get to the bottom of this or he could have some shame and pay up. I agree Sharon but a lot of the examples that this administration sets is do as we say NOT as we do. For a council member to not pay there taxes year after year is not a person to be on council. They have no shame and the borough is setting a example by letting this to continue . The person should step down or be removed by the other 6 , and the mayor should be on this to up hold the reputation of himself and the town, But alas this is Columbia and the back door bull crap continues to make us the laughting stock of the area! If you represent a borough you should have clean hands and be transparent. I will say that I had the pleasure of driving up Locust Street in Columbia last night and it looked fantastic. That being said, there wasn't a single person to be seen anywhere. Property Taxes go against the Property, not the Owner. Property Taxes are attached to the Property, and never attached to the owner. It is not fair to hold the over due property taxes against the owner. Now matter who the owner is, the property pay the taxes, eventually. THE OWNER OWES THE TAXES , IT COMES IN THE OWNERS NAME NOT THE ADDRESS!!!! SHAME ON ALL INVOLVED the owner and the borough people ,, COLUMBIA is the laughting stock with things like this , THE OWNER HAS NO SHAME AND SHOULD NOT BE SPENDING people who pay there taxes monies , this kind of thing is going to get to the media and we'll see if the person has any shame.THink of this under the Lutz administration a council member owes back taxes but they are not his , it is the properties to pay , and he is STILL on council. IF this is how this group works no one in Columbia should pay any taxes fines from codes or any thing related with property , see how long this works out . SLECTIVE ENFORCEMENT HAS BEEN GOING ON IN COLUMBIA FOR YEARS , so if it is good for a council member it must be the same for all of the citizens. COLUMBIA TAX PAYERS call the borough and tell them that you are going on this plan . Tell them to contact the property with any questions. no contact the council member who started it. To the borough or council member HOW DOES THE PROPERTY PRODUCE INCOME and who turns the capital over to the pay the bills ??? ?